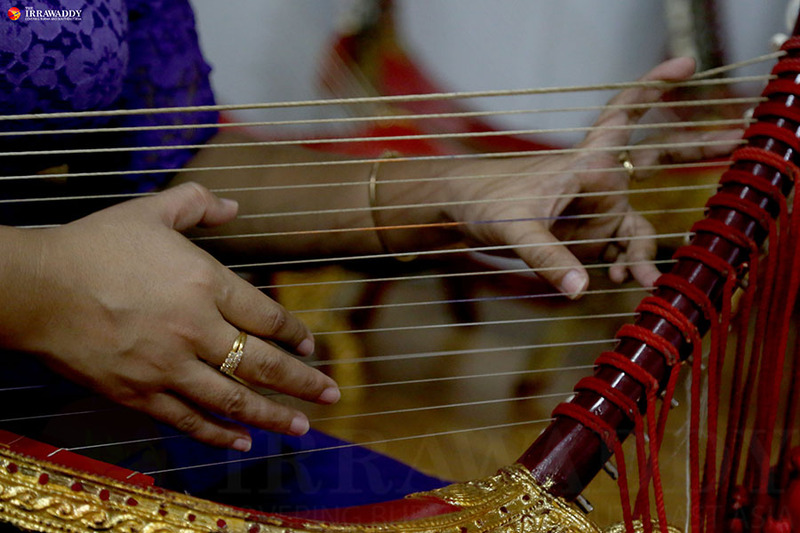 YANGON — Every day, a 9-year-old girl watched her sister’s fingers pluck the strings of an instrument. The hook-shaped wooden object was the first instrument she had ever seen. She loved the sounds the strings made and felt tenderness and fondness just looking at its curved shape. Despite her fascination with the instrument, she was not allowed to touch it. Her sister’s harp master thought that the strings would be out of reach for the young girl to play while holding it. But she was desperate and badgered the harp master to teach her as well. After weeks of persistence, she was rewarded. The harp master brought a small harp with lower strings and began to teach her to play. “I was finally allowed to hold it and it made me feel like I mattered,” Ma Su Zar Zar Htay Yee said, recalling how important she felt holding the little instrument for the first time. “They didn’t take me seriously before that,” she said, with a laugh. 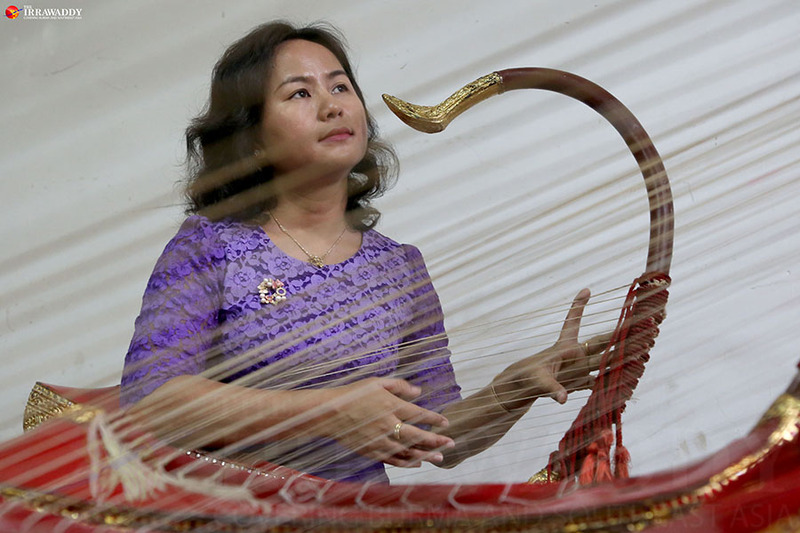 Nearly three decades later, the passionate girl who fell in love with the Myanmar harp finds herself helping the Burmese government draft the country’s first music textbook for primary students. The Myanmar harp or “Saung” has reportedly existed in the country since the Pyu period – around 900 AD. It was played at palaces and appreciated by kings, queens and courtiers in the country’s ancient times. Myanmar traditional instruments are still tuned primarily to harp scales and it was, and still is, regarded as a royal, national instrument. Su Zar Zar graduated from the National University of Arts and Culture (NUAC) with a bachelor’s degree in music. She completed a doctorate degree in musicology from the Tokyo National University of Fine Arts and Music and now works as a music tutor at the NUAC and a part-time curriculum officer at Japan International Cooperation Agency (JICA), which has been helping the Myanmar government draft music textbooks for schools. People’s misconception is that arts education is not as important as academics, making the arts lose their luster in Myanmar society, she said. “We have to understand that the subjects that are currently regarded as co-curriculums are equally as important as other core curriculums,” she said, adding that children should begin studying music in primary school. “Art inspires people to be gentle and softhearted,” she said, stressing that art plays a vital role in cultivating children. “If there is university-level music education in our country, there should also be high school, middle and primary school levels as well,” she highlighted, saying that it’s “embarrassing” for a university to provide primary school level music education to its college students. Despite being a traditional harpist, she believes that claiming traditional music is more grandiose than modern music doesn’t make sense, and such an opinion is very “narrow-minded,” she said. Older generations are keen to criticize young people for not valuing or appreciating traditional Myanmar music, but there are so few venues where it is regularly performed, she said, pointing out that many of the performances occur at high-end places that hope to attract foreigners. She also stressed the need to preserve Myanmar traditional music as a “national identity” and urged the government and authorities to create art houses where traditional artists and art students can engage with the public rather than solely perform for tourists at restaurants. Though Su Zar Zar’s parents were supportive, other relatives were reluctant when she started playing the harp, insisting that her grades would suffer. Then, at age 11, in 1990, she was invited to record a 15-minute traditional harp solo at Myanmar Radio and Television (MRTV), formerly known as Burma Broadcasting Service (BBS). She placed first at government-organized annual traditional arts competitions – from amateur to professional levels – nearly every year. “When I was a young trainee, I used to practice at my teacher’s place. I saw passers-by stop to watch and listen, as his house faced the street,” said the 38-year-old single mother of two, and owner of seven dogs, of her days as a young harpist. After years of practice, she took a sudden break when she began working as a tutor at the NUAC’s English department in 2001. “I was not supposed to teach English but I did because of the department’s requirement,” she said. “I didn’t play the harp during that time,” she added. Married with two kids, the woman who intended to be a harpist and not an English tutor, came to a turning point in 2008 when she went to Japan as a state scholar. But it came at a price. She had to leave her toddler son, 6-year-old daughter and sick mother behind with her older sister. With tears in her eyes, Su Zar Zar discussed the separation from her children and her failing marriage. “It broke my heart every time I heard my daughter’s voice on the phone. I cried every single day like a crazy person,” she said. The only thing that kept her in Japan was a will to finish what she started. “I knew I wanted a different life and a fresh start,” she said. She came back to Myanmar with a doctorate degree in musicology after eight years, making her the first and only Myanmar woman living in the country to hold a PhD in the subject. “The reason why I chose musicology was that Myanmar has so few [written] records of its [traditional] music,” she said, adding that she could not even find detailed biographies of the country’s late musicians or singers. Renowned classical musicians Alinka Kyaw Swa U Ba Than and Inlay U Myint Maung being her favorite harpists, her PhD dissertation was about improvisational techniques on the harp. “I wanted to do research and be able to leave records for later generations to study,” she said. The initial paper was written in Japanese and she feels a responsibility to translate it to Myanmar for her targeted audience. Since her return to Myanmar in 2015, she has been trying to make up for the missed years with her children and teaching at the NUAC – not for the English department anymore, but for the music department.